New York's art glitterati was out in force last week for the Socrates Sculpture Park annual benefit gala which was held at artist Mark di Suvero's sprawling studio complex on Long Island City (di Suvero founded the nearby waterfront park which has become a New York sculpture hot spot). Guests including the artist Christo and the famed patron Agnes Gund, as well as the artist Ursula von Rydingsvard who was honoured on the night, sauntered through the studio and peeked into di Suvero’s work space cluttered with forklifts and chunks of rusted steel, his library with books stacked to the ceiling, exhibition spaces and live-in studios for young artists. Outside the sculptor has his own vineyard in an area of Long Island City that was an illegal dumping ground right alongside the East River. Though mostly confined to a mechanised wheel chair, di Suvero delivered a stirring speech. “This world is so divisive but art holds us together,” the artist said. Rather than pedestrian gift bags to complete the evening, the Batalá New York samba band performed. 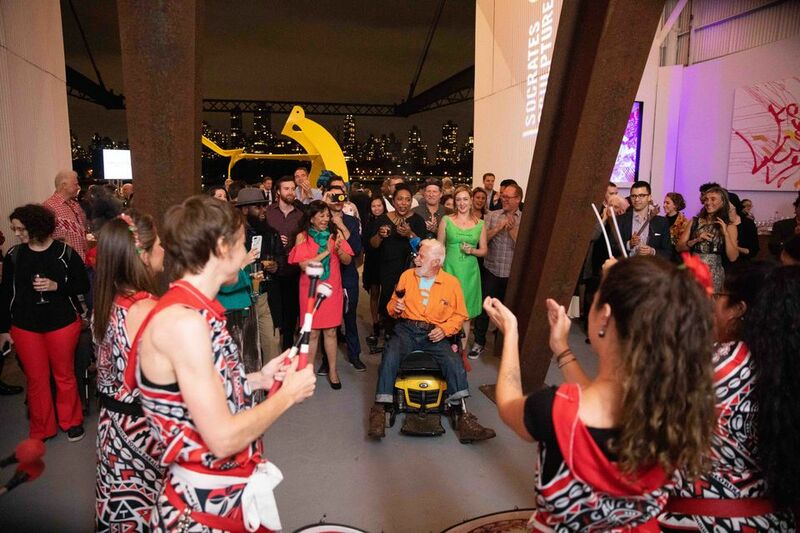 Guests were invited to drum on di Suvero’s latest rusted steel sculptures as the artist, once a steel drummer himself, frequently does.